It is an interesting idiosyncrasy of our times that we have become increasingly accustomed to the ongoing success of the human mind in probing reality and understanding the world we live in. Indeed, the relevance of this ever growing body of knowledge, describing the universe and ourselves in greater and greater detail, cannot be overstated. But today, even the most breathtaking technological breakthroughs, fostered by this knowledge, can hardly capture the collective attention span for long. It is as if we have come to expect our technological abilities to steadily accelerate and reach breakneck speeds. On the other hand, we have also become very accustomed, and alarmingly indifferent and unconcerned, about the state of human affairs. As a species, our recent terraforming activities have fundamentally transformed the biosphere we rely on, resulting in considerable impact for us individually. In a nutshell, we have devised linear systems that extract resources at one end, which, after being consumed, are disposed of at the other end. However, on a finite planet, extraction soon becomes exploitation and disposal results in pollution. Today, this can be witnesses at unprecedented global scales. Just consider the following: substantial levels of pesticides and BPA in vast populations and even remote populations (like Inuit women whose breast milk is toxic due to pollutants accumulating in the ocean’s food chain), increase of chronic diseases, antimicrobial resistance, the Great Pacific and the North Atlantic garbage patches, e-waste, exploding levels of greenhouse gases, peak oil and phosphorus, land degradation, deforestation, water pollution, food waste, overfishing, dramatic loss of biodiversity,. . . The list is constantly growing as we await the arrival of the next billion human inhabitants on this planet. Compounding this acute problem is the fact that today’s generations are living at the expense of future generations, ecologically and economically. For instance, we have reached Earth Overshoot Day in 2015 on the 13th of August. Each year, this day measures when human consumption of Earth’s natural resources, or humanity’s ecological footprint, approximately reaches the world’s biocapacity to generated those natural resources in a year. Since the introduction of this measure in 1970, when the 23rd of December marked Earth Overshoot Day, this tipping point has been occurring earlier and earlier. Moreover, just check the Global Debt Clock, recording public debt worldwide, to see an incomprehensibly and frighteningly high figure, casting an ominous shadow over future prosperity. Yes, the outlook is very dire indeed. In essence, we have an abundance of individual intelligence, fueling knowledge generation and technological proficiency, but an acute lack of collective intelligence, which would allow our species to co-evolve and co-exists in a sustainable manner with the biosphere that keeps it alive. This is the true enigma of our modern times: why does individual intelligence not foster collective intelligence? Take, for instance, a single termite. The biological capacity for cognition is very limited. However, as a collective swarm, the termites engineer nests they equip with air-conditioning capabilities, ensuring a constant inside temperature allowing the termites to cultivate a fungus which digest food for them they could otherwise not utilize. Now take any human. Amazing feats of higher cognitive functioning are manifested: self-awareness, sentience, language capability, creativity, abstract reasoning, formation and defense of beliefs, and much, much more. Remarkably but regrettably, multiplying this amazing potential and capacity times a few billion results in our current sate of affairs. It is interesting to note that all biological systems do not feature centralized decision making. There are no architect or engineering termites overseeing construction, no CPU in our brains responsible for consciousness. This decentralized and bottom up approach appears to result in the emergence of collective intelligence, in other words, in self-organization, adaptivity, and resilience. Indeed, this incredible robustness of biological complex systems is most probably the reason why we still can continue with “business as usual” despite the continued devastating blows we have delivered to the biosphere. In stark contrast to these natural systems, all human systems, from political to economic, are all characterized by centralized governance. This top down approach to collective organization appears to systematically lack adaptivity, resilience, and, most importantly, sustainability. This is a strange, rather perverse story. Just to put it in very simple terms: it’s a story about us, people, being persuaded to spend money we don’t have, on things we don’t need, to create impressions that won’t last, on people we don’t care about. The reality of the society we’re in, is there are thousands and thousands of people out there, leading lives of quiet scream- ing desperation, where they work long hard hours, at jobs they hate, to enable them to buy things they don’t need, to impress people they don’t like. Huge swathes of people, in Europe and North America in particular, spend their entire working lives performing tasks they secretly believe do not really need to be performed. The moral and spiritual damage that comes from this situa- tion is profound. It is a scar across our collective soul. Yet virtually no one talks about it. Our collective psyche is suffering under the current zeitgeist. In just a few decades the complexity and uncertainty of the lives we lead has dramatically increased and we now struggle even harder to find meaning. So, was this it? Are we simply yet another civilization at the precipice of its demise? Are we just a very brief, albeit spectacular, perturbation in the billion year history of life on Earth, which will undoubtedly adapt and continue for billions of years until our sun runs out of fuel? Perhaps things are not as they seem. 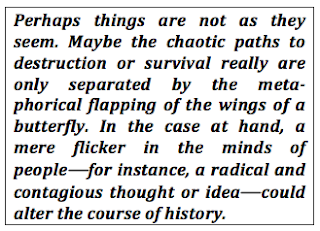 Maybe the chaotic paths to destruction or survival really are only separated by the metaphorical flapping of the wings of a butterfly. 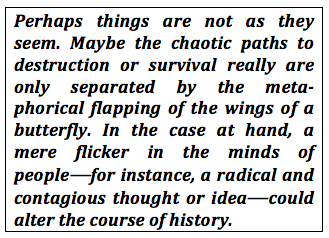 In the case at hand, a mere flicker in the minds of people — for instance, a radical and contagious thought or idea — could alter the course of history. Indeed, perhaps acquiring collective intelligence is not as hard as we might imagine. What is missing is possibly a subtle change in the way we perceive and think of ourselves and the world we inhabit; a change that would initiate a true shift in our behavior which could lead to adaptive, resilient, and sustainable human systems and interactions. Maybe the difficulty lies in the simple fact that we all first need to focus on ourselves for the common ground to emerge which would allow global change to flourish on. One of the earliest and strongest constraints everyone of us as child is confronted with is the imprinting of local and static sociocultural and religious narratives, mostly emphasizing external authority. To resist this initial molding requires a very critical and open-minded worldview, not something every human child comes equipped with. What would happen if we would replace these obviously dysfunctional foundational stories that we have been telling our children? What if we, as a species, agreed to convey ideas to the next generation which do not simply depend on the geographic location of birth but represent something more functional, universal, and unifying? Ideas that also stress self-responsibility and self-reliance? Modern neuroscience heavily emphasizes the plasticity of the human brain. This neuroplasticity reflects how the brain’s circuits constantly get rewired due to changes not only in the environment, but crucially also in response to inner changes within the mind. Cultivating different thought patterns results in different neural networks. As a consequence, we should never underestimate how untainted young brains, exposed to novel empowering ideas, could result in a generation of “new” humans, significantly different from the last one. Possibly some of the following ideas could meet this challenge — ideas capable of transforming the inner space of the mind and thus having the power to emanate into the outer world. First, acknowledge that you are not the center of the universe. The local “reality bubble” you live in is arbitrary and infused with ideas relevant to the past. Your way of life is not representative or defining for the human species. Foreign ideas, beliefs, and ways of life are as justified as your own ones. The way you perceive reality depends on the exact levels of dozens of neurotransmitters and the biologically evolved hardwiring in your brain. In efect, what appears as real and true is always contingent and relative. Reality could be vastly richer, bigger, and more complex than anyone ever dared to dream. And never forget to appreciate the amazing string of measurable coincidences that had to conspire for you to read this sentence: from the creation of space, time, and energy, to the formation of the first heavy elements in the burning cores of stars which then got scattered into the cosmos when they exploded as supernovae and started to assemble into organic matter, which could store information and spontaneously began to replicate, sparking the evolution of life, which gradually reached ever higher and higher levels of complexity until a lump of organic matter, organized as a network of dozens of billions of nodes and roughly 100 trillion links, became self-aware. Secondly, place yourself into the center of your universe. You alone are in charge of your life and solely responsible for your actions. You have the freedom in your mind to choose how you respond to internal urges and external influences. You can strive to cultivate a state of happiness and gratitude in your mind, regardless of the circumstances outside of your mind. Embrace change and accept that impermanence is an immutable fact of life. Let go of the illusion of control. Finally, cultivate a dynamic and inclusive mindset. Assume that all people act to the best of their possibilities and capacities. Face the fact that you can be very wrong in the beliefs you deeply cherish and avoid the illusion of knowledge. Be open to the possibility that other people could be right. Allow your beliefs and ideas to be malleable, adaptive, and self-correcting. Try and strike a healthy balance between critical thinking and openmindedness. Can we dare to imagine a future, when we teach our children to be empathetic but critical thinkers? When we teach them to be independent and not to seek acknowledgment form others but only themselves? When we teach them not to fear and discriminate against what is perceived as different and foreign; not to fear change and frantically cling on to the status quo, but to face the never ending challenges of life with confidence and trust? Imagine the collective intelligence that could emerge from a “swarm” of such individuals, emphasizing social inclusion next to cultivating a deep feeling of connectedness to the matrix of life and a profound appreciation of being an integral part of the enigma of existence. 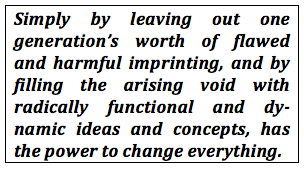 Simply by leaving out one generation’s worth of flawed and harmful imprinting, and by filling the arising void with radically functional and dynamic ideas and concepts, has the power to change everything. What if we already are in the middle of the transition and have not yet realized that it is happening? Despite the fact that we are still fueling dysfunctional collective ideas, perhaps we are already witnessing the beginning of a profound paradigm shift towards collective intelligence. Take the recent emergence of decentralized financial and economic interactions that are slowly disrupting the status quo. For instance, the nascent rise of the blockchain ledger in a trustless peer-to-peer network enabling unthinkable new ways of human economic cooperation. Or the impact of free-access and free-content collaborative efforts providing us with unrestricted availability of nearly unlimited knowledge and constantly evolving, cutting-edge software. Or peer-to-peer lending, crowdfunding, and crowd-sourcing with the capacity to leverage the network effect created by a collective of like-minded people. And not to forget the success of shareconomies, offering a radically different blueprint to the way business has been conducted in the past. All these new technologies are based on bottom up, dynamic, decentralized, networked, unconstrained, and self-organizing human interactions. It is impossible to gauge the future impact of these systems today. Similarly, imagine trying to asses the potential of a new technology, called the Internet, in the early 1990s. No one had the audacity to predict what today has emerged form this initial network, then comprised of a few million computers, now affecting every aspect of modern human life. 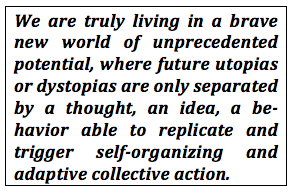 We are truly living in a brave new world of unprecedented potential, where future utopias or dystopias are only separated by a thought, an idea, a behavior able to replicate and trigger self-organizing and adaptive collective action. So, where will you be at the dawning of human collective intelligence? Part I focusses on formal thought systems, mathematics, and physics---in great detail, as witnessed by the over 140 equations introduced to the reader. In essence, Part I is a testimony to the human mind's unprecedented understanding of the workings of the reality it finds itself embedded in. Then, in Part II, notions of certainty are deconstructed, with respect to knowledge, truth, and reality. The subjective, context-dependent, and ambiguous nature of every experience and belief is emphasized. So where does this leave us? Do we really live in a cynical universe, which reveals itself to the human mind just as far as it awakens the false hope in its comprehensibility and leaves us forever in a state of epistemological nihilism? I sincerely believe otherwise: enter Part III. With brave, radical, out-of-the-box thinking, I believe we can advance our knowledge of the most fundamental questions relating to our existence and existence itself. Some such ideas are: the information-theoretic and information-processing foundation of reality (universe as computer, reality as a simulation) next to the primacy and/or universality of consciousness (consciousness creates reality). What is real? Well, all of this obviously. But what exactly is it? OK, so you all woke up this morning. A sense of self kicked in. [break] Memories returned. [break] And you became aware of an external world. So, you are an entity that exist in a physical reality. But this begs three questions. [break] What can we know about these things? [break] What is the true nature of reality? [break] And what is an “I” anyway? OK, so let’s start with the question of knowledge. “Those who feel certainty are stupid, and those with any imagination and understanding are filled with doubt.” This is from the great philosopher and mathematician Bertrand Russell. [break] “While differing widely in the various little bits we know, in our infinite ignorance we are all equal.” Karl Popper was one of the most influential philosophers of science. And in the same vein: [break] “Our comforting conviction that the world makes sense rests on a secure foundation: our almost unlimited ability to ignore our ignorance.” Daniel Kahneman is the father of behavioral economics and a Nobel laureate. OK, so let’s agree that from a philosophical point of view the notion of certainty is a bit tricky. But we have science, which is a knowledge-­‐generation machine. Or not? Ever since the Pythagoreans, people have realized that the book of nature is written in the language of mathematics. Or in the words of the great mathematician David Hilbert: [break] “Mathematics is the foundation of all exact knowledge of natural phenomena.” But this raises a very profound question. “Fundamentally, we do not know why our theories work so well.” [break] And “The deeper an explanation is, the more new problems it creates.” David Deutsch is one of the pioneers of quantum computing. But the bewilderment does not stop here. “There is no logical path to these laws; only intuition can reach them.” [break] “Perhaps it is culture rather than nature that dictates the content of scientific theories.” Now intuition and culture don’t usually spring to mind when thinking about science. And are also not really ideas one would associates with these two great physicists. “Modern physics has conquered domains that display an ontology that cannot be coherently captured or understood by human reasoning.” Ernst von Glasersfeld was a distinguished philosopher who coined the term “radical constructivism”. This is the idea, that all knowledge is always subjective. But what exactly is he talking about here? Let’s zoom into the fabric of reality. In other words, let’s enter the quantum world. [break] These are symbols from the book of nature. This equation describes the birth of quantum physics. Something no one saw coming. Indeed, Max Planck introduced it in an act of despair. [break] And it turns out that this new realm of reality is a truly bizarre place. Particles behave as waves and vice versa, depending on how you look at them. [break] There is an intrinsic limit to the amount of information you can have. [break] And everything is instantaneously connected to everything else. This is called entanglement and you can use it to encrypt information. But things get worse. Some quantum experiments are truly mindboggling: they appear to alter the past or break causality. OK, let’s look at the universe. What is out there? [break] Well it turns out that of all the stuff there is, only 5% is ordinary matter. 26% is called dark matter, and no one really knows what it is made of. And 69% is dark energy, some mysterious force in the vacuum making our universe expanded faster and faster the bigger it gets. This was discovered in 1998 and was awarded with a Nobel prize. And even things as innocuous as time, can be very problematic on closer inspection. So much so, that some physicists suspect it doesn’t really exist. [break] “The passage of time is simply an illusion created by our brains.” [break] And what about emergence and self-­‐organization. This is a map of the internet. It is as though there is a fundamental force in the universe driving it to ever higher levels of complexity and structure. Just look at ants: where does this collective intelligence come from that allows them to become such an amazingly clever super-­‐organism. And why can’t we humans achieve this? OK , so reality is indeed a very weird place. But perhaps we can find a sanctuary of clarity and regularity within ourselves. Let’s look at our brains and how we perceive the world. [break] “Instead of reality being passively recorded by the brain, it is actively constructed by it.” [break] “You're not perceiving what's out there. You're perceiving whatever your brain tells you.” [break] “What we call normal perception does not really differ from hallucinations, except that the latter is not anchored by external input.” Wow. But at least I am in control of my mind. Or not? These are the words of David Eagleman. He is a neuroscientists and writer. And yes, things get worse. These two books are an embarrassment to any human being who believes in rationality. Countless experiments show how easily we can be manipulated. Without ever suspecting a thing. And don’t fool yourself. We all fail equally at this. And then things can go terribly wrong in the mind. This book on psychopathology is a frightening 800 pages thick. …this. This is Christian Rätsch. He is an anthropologist specialized in ethnopharmacology. His book, called “The Encyclopedia of Psychoactive Plants” is nearly 1’000 pages thick. And remember what Eagleman said about hallucinations: they are just as real. Perhaps this realization prompted the next quote. There are these extraordinary other types of universe. Aldous Huxley was talking about his experiences with LSD. So what does this all mean? Where does it leave us? Well, if we are really honest, the answer is [break] We don’t know. Basically we are back to René Descartes. “I think therefore I exists”. So, the only thing I cannot deny, is that I am having a subjective experience now. That’s all. But perhaps we can do better. Perhaps if we are willing to abandon some of our cherished beliefs about reality we can start to understand more. And there is a glimmer on the horizon. Information is physical. [break] All things physical are information-­‐theoretic. John Wheeler helped develop general relativity giving us the word black hole. And Rolf Landauer made important contributions to information processing in the 60s. “The universe is made not of chunks of stuff, but chunks of information — ones and zeros.” [break] “Quantum physics requires us to abandon the distinction between information and reality.” Seth Lloyd and Anton Zeilinger are currently pioneering the field of quantum information. They are helping us build quantum computers. Objectivity is the illusion that observations are made without an observer.” Heinz von Foerster was a physicists and philosopher and one of the pioneers of cybernetics. But finally, a word of caution. Although these last quotes come from very sober and keen thinkers, they still could be wrong. In fact, everything I have been saying could be wrong. But if we all really are in charge of our own universe, made of pure information, it is essential for us to look for wisdom and truth within ourselves. Perhaps looking for reality outside of the mind is the wrong way to go. Thank you. I don't really recall when this all started. Ever since I was 15 I wanted to study physics. After graduating in 1999, I had more questions than answers relating to reality and consciousness. In 2001: "On the Structure of the Vacuum and the Dynamics of Scalar Fields" (here) looking at some of the limits of modern physics. My first job (which would last for 12 years, where I was developing trading model algorithms for the FX market at Olsen Ltd) was an intuitive transition from fundamental physics to complex systems. "A New Kind of Science" by S. Wolfram. In 2005 I was looking for a new challenge in addition to my work and googled the Chair of Systems Design by chance. Applied for a PhD there (50% next to my finance job) and had to give a talk that summer where I started to think about the analytical/algorithmic and fundamental/complex paradigms; "Alternate Realities: Mathematical Models of Nature and Man" by J. Casti: science as the art of encoding reality domains into abstract representations. In the summer of 2006 I read "Zen and the Art of Motorcycle Maintenance" by R. Pirsig in a hammock on one of the Andaman islands after visiting Delhi and Varanasi for our charity noon.ch. I consolidated a lot of stuff between 2006 and 2009. These blog posts at Olsen Ltd and stuff on my old webpage: 1, 2, 3, 4. It all got more serious when I took a course on the philosophy of science during my PhD in 2008: G. Brun and D. Kuenzle, ETH Zurich. All of this now fuelled the contents of Appendix A of my dissertation (2010, PDF) which got updated and published in Springer's Theses series (2013): Laws of nature; paradigms of fundamental processes and complex systems; epistemological and ontological challenges; postmodernism, constructivism, and relativism. Which then prompted these blog posts about certainty, reality, and perception: 1, 2, 3, (2011 - 2012). Sometime: "Programming the Universe: A Quantum Computer Scientist Takes on the Cosmos" S. Lloyd. 2011: "The Passion of the Western Mind: Understanding the Ideas That Have Shaped Our World View" R. Tarnas, "Incognito: The Secret Lives of the Brain" D. Eagleman. Ideas which also flowed into this Ignite talk in 2011 (or as blog post), which represents a rough sketch of the current talk. 2012: "The Ego Tunnel: The Science of the Mind and the Myth of the Self" T. Metzinger. Not sure when the ideas of consciousness entered the picture, but happy to see such crazy ideas also being espoused by scientists and philosophers today. 2016: Contributed a chapter called "What is Reality?" to Lucy and Stephen Hawking's children's book "George and the Blue Moon". See more.